Tania graduated with a Bachelor of Nursing from Charles Sturt University Bathurst in 2001. She then undertook post-graduate training in Perioperative Nursing in 2003 at the University of Technology, Sydney, and in Breast Care Nursing at La Trobe University in 2011. Tania began working for Specialist Breast Care in 2002 as the Practice Manager and Registered Nurse. Her role encompasses all aspects of medical practice management and reception, as well as assisting Dr Thomson with all in-room procedures. 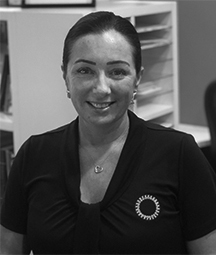 Tania is responsible for liaising between all members of the multidisciplinary team involved in the management of Breast Cancer patients and is therefore very capable at dealing with your enquiries regarding your treatment regimes. Tania is available to you as one of our patients, to assist you in understanding your treatment, and to provide you with support and information when required. Tania has an excellent understanding of Medicare and Private fund billing procedures and is able to assist you in understanding your fees.